Q: So Microsoft has confirmed that Zune, the “iPod/iTunes killer” project that Engadget has been reporting on for a few weeks, is for real. It’s a “music and entertainment” project that will involve portable players, an online media store, and desktop software for managing media and getting content from the store onto the players; all of it integrated and all of it produced and sold exclusively by Microsoft themselves. Does this sound familiar? Q: I mean, if this is even vaguely the form factor of the device they plan to ship, it’s so shameless a rip-off that they might as well have called it the “xPod” or even the “Ipod” (“It’s a totally different name — we have a capital ‘I’, see!”). The scroll wheel, the sparsity of buttons, the plain white facade. But that “Microsoft Designs the iPod Package” video be damned, you just know there are executives at Microsoft dying to slap a logo on the front of this thing, right? 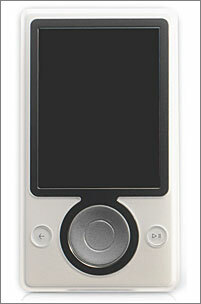 Q: Speaking of logos, what about the Zune logotype that’s going around? With the magenta-to-orange gradient and weird overly-complicated Necker-cube-ish Z-shape mark? That’s just temporary, right? Q: According to Engadget, the Zune service and devices won’t just be separate from Microsoft’s PlaysForSure platform, they’ll be wholly incompatible with each other. I’ll bet that’s just delightful news to all of Microsoft’s “PlaysForSure” partners like Creative Labs and Napster. Q: But yet Engadget reports, “Microsoft will continue to support and develop for their PlaysForSure initiative, but all things PlaysForSure are handled by [an] entirely separate division that will not have any crossover.” Is that not the epitome of metastatic corporate bureaucracy? One division within Microsoft spending $100 million or more to launch their own closed media player system; another division charged with lining up “partners” for the PlaysForSure platform that Microsoft’s own media player division deems not good enough. Q: Isn’t that like inviting guests to your home for dinner and serving them hot dogs while you yourself eat a steak? Q: And so now that Microsoft is abandoning the licensing model (or at least deprecating it) in favor of a closed model that they completely control, will all those pundits who’ve been predicting doom for the iPod for the last four years declare that Microsoft, like Apple, is now making the same mistake with Zune that Apple made with the Macintosh in the 1980s? Q: I was being sarcastic. My point is that it’s now late July, and despite the fact that there are leaked photos and a features list the length of your arm, no one has claimed to have actually seen a working prototype. And some of these proposed features, like peer-to-peer file sharing and proximity-based recommendations, sound rather like a lot of work. Do they honestly expect to have this on the shelves in time for Christmas? Q: So what they’ve done is leak a November release date and a fantastic feature list — a feature list that the next batch of new iPods, no matter how cool, are unlikely to match — and hope that people will wait for the Zune. And then even when it misses the holiday season and slips into 2007, and won’t include all of the previously-promised features, they’ll say it wasn’t their fault (despite the fact that the whole point of the Zune platform model is that Microsoft controls the entire system) but that it’ll be worth the wait anyway. That sound right? Q: As for “Coming Zune”, Microsoft’s ostensibly “viral” teaser site featuring an animated guy stroking a bunny rabbit while a six-inch-tall man moves in for a hug — well, the less said the better. Q: Back to the form factor. Again, presuming this is really what the thing looks like, it seems almost comical that Microsoft is so clearly mimicking the look of the current iPods. The best they can do with such a design strategy is to approach the coolness of the current iPods; whereas Apple itself is always at work on new designs that make their own current ones look dated. Sure, there are all sorts of innovative new features supposedly slated for the Zune, but if people look at it and their initial reaction is “Oh, it’s an iPod rip-off,” that’s a pretty crummy first impression. Does anyone at Microsoft realize that rip-offs aren’t considered cool? Q: Then again, Pablo Picasso said, “Good artists copy. Great artists steal.” By that standard the people on the Zune team must be a bunch of Michelangelos, eh? Q: As for Apple, well, Steve Jobs is a big fan of that Picasso quote. My guess is they’ve been expecting this, that Apple expects their competitors, especially Microsoft, to copy everything they do, and that thus the only thing they find surprising about Zune is that it’s taken this long for Microsoft to attempt to copy the entire iPod/iTunes/ITMS troika. Agree? Q: But Microsoft does have one genuine ace in the hole: their mountain of cash. They can’t buy taste, but they can burn money. One of their rumored features is an ITMS converter, where the Zune desktop app will go through your iTunes music library and look for songs purchased through the ITMS, and they’ll give you “free” versions of those same songs from the Zune music store, and Microsoft will just pick up the tab with the record labels. That’s actually a pretty clever idea, isn’t it? Q: Microsoft’s rumored “we’ll just buy them another copy of every song they bought from ITMS” feature — pretty clever, isn’t it? Q: And hardware-wise, if they’re really serious about this, they’ll do what they’ve done with the Xbox: cram $800 worth of components into a $400 box and lose hundreds of dollars on each unit sold. There’s something perverse about the fact that the only recent brand-new product from Microsoft that’s considered a success is the Xbox, which according to Forbes lost $4 billion from 2001-2005. That’s enough money to sink most companies, but it was just a small slice of Microsoft’s cash hoard. A similar strategy with the Zune would prove difficult for Apple to follow, would it not? Q: On the other hand, although the Xbox 360 is slicker than the original Xbox, it’s still bigger, clunkier, hotter, and louder (fan-wise) than the PS2 and GameCube. Those traits are OK for a game console that goes in your entertainment center, but they’re not OK for a portable media player that goes in your pocket. If their $60 billion bank account hasn’t yet helped Microsoft develop a penchant for the simplicity/clarity/elegance thing, it never will, will it? Q: Should I even bother asking whether Zune will work on the Mac?